Recent research has shown that exercising with a more capable partner where one’s performance is indispensable to the group (referred to as the Köhler motivation gain effect) leads to greater effort in partnered exergame play. 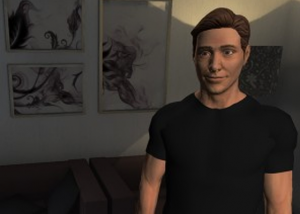 Based on positive results with young adults, current research is examining whether a Köhler effect can be observed in an exergame by middle-aged adults exercising with a moderately superior software-generated partner– one that is anthropomorphic but clearly artificial and synthetic. The current research includes middle-aged adults interacting in a custom designed exergame that involves holding a series of five plank exercises for as long as possible. Ss complete the exercise individually, and after a rest, completed the same exercises with either a software-generated partner (SGP), or no partner at all (IC). The partner is presented as being slightly more capable at the plank activity than the Ss based on the Ss initial exercise scores. The experiment includes measures of exercise persistence, perceived exertion, self-efficacy beliefs, enjoyment, and intentions to exercise. The designs of the characters were based on focus groups with the target audience. The SGP is represented as a three-dimensional animated male or female character generated out of Mixamo Fuse and then customized in Maya. The SGP speaks through the voice of a prerecorded voice actors and moves with human-like motion based on a combination of human motion capture date, keyframe animation, and software generated movements. The Ss initially meet the SGP during either an interactive dialog based on a preconstructed dialog tree or a prescripted, non-interactive dialog to attempt to establish a human-like relationship with the partner. The exergame was inspired by the Playstation 2 Eyetoy: Kinetic, though the Kinetic does not employ a SGP. The exergame was custom built in C# on top of the Unity3D engine. The graphical user interface was built on top of the NGUI architecture. The CyberPartners game has been exhibited, presented about, and is the subject of scholarly research publications. Feltz, D.L., Forlenza, S.T., Winn, B., & Kerr, N.L. (2014). Cyber buddy is better than no buddy: A test of the Köhler motivation effect in exergames. Games for Health Journal: Research, Development, and Clinical Applications. 3(2), 98-105. doi:10.1089/g4h.2013.0088. Winn, B., Max, E., Kozman, G., Jeffery, W., Durand-Hollis, X., Forlenza, S., Samendinger, S., Kerr, N., Pfeiffer, K., & Feltz, D. (2014, October). The design of a software-generated workout partner to boost motivation in exergaming. Proceedings of the International Conference on Meaningful Play, East Lansing, MI. Forlenza, S. T., Feltz, D. L., Winn, B., & Kerr, N. L. (2014). Cyber buddy is better than no buddy: A test of the Koehler motivation effect in exergames. Journal of Sport and Exercise Psychology, 36. Presentation and Published Abstract at North American Society for the Psychology of Sport and Physical Activity, Minneapolis, MN. Winn, B., Max, E., Kozma, G., Jeffery, W., Durand-Hollis, X., Forlenza, S., Samendinger, S., Kerr, N., Pfeiffer, K., & Feltz, D. (2014, October). The design of a software-generated workout partner to boost motivation in exergaming. Proceedings of the International Conference on Meaningful Play, East Lansing, MI.